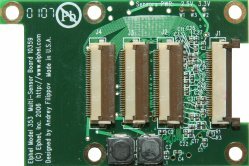 Multifunctional processing board with FPGA. Can be used to connect up to 3 of the sensor boards (i.e. 10338, 10347) to a single system board. It can also process the image data.